Hello! I just found your wonderful website and blog, and am hoping you can help me identify my Dooney & Bourke bag. It was a gift in the 1980s, and it looks very similar to the vintage Zipper Clutch you have on your site. 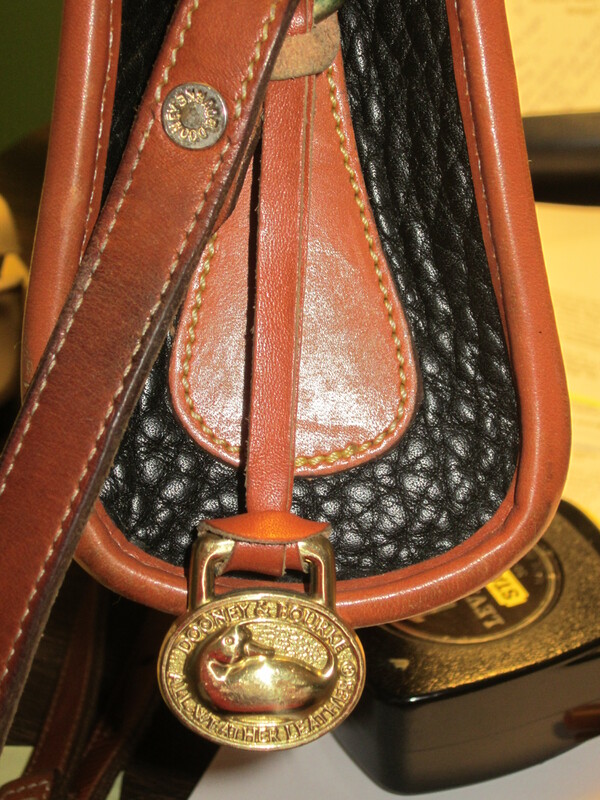 It is all-weather leather, black and tan, with a “Dooney & Bourke, Inc. Made in U.S.A.” tag inside, with the number A1759857 on the other side of the tag. It has a outer pocket/sleeve on each side. I haven’t used it for years, and in cleaning out my closet, came across it and got curious about it. If you have time, may I send you photos? Thank you! I know how busy you are, and I appreciate it. 1. Bag was received as a gift in the late 1980s (I’m too old to remember exact year!). 2. 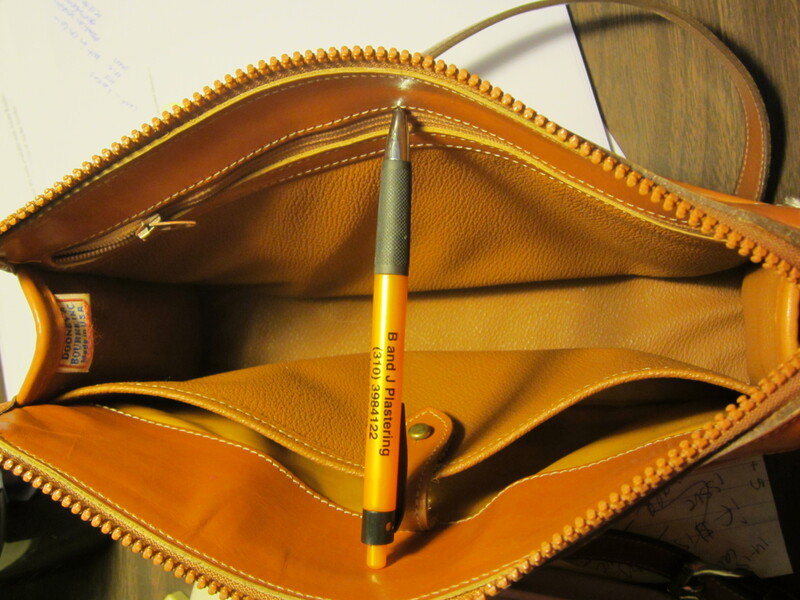 Bag is black and tan, all-weather leather (black leather is pebbled, tan is smooth). 3. Bag dimensions are approx. 10 3/4 inches long x 7 inches tall x 2 1/2 inches deep (measuring across bottom). 4. Bag has a metal zipper (pull tab on zipper says “Dooney & Bourke”), two outer pockets/sleeves (one on each side), two inside pockets/sleeves (one zippered with a metal zipper; the other open but with a leather tab that closes over a metal button). 5. 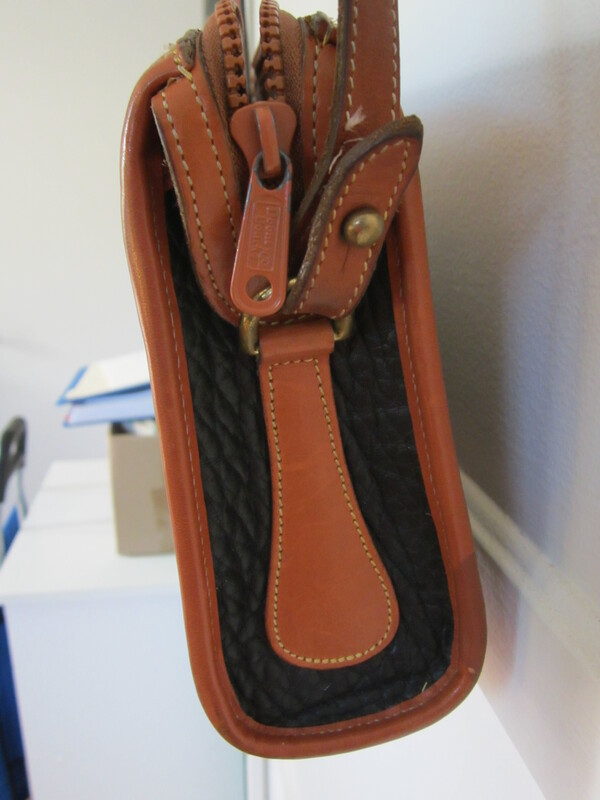 The strap is quite long and attaches on each side of the purse to brass D-rings; the straps are removable. 7. 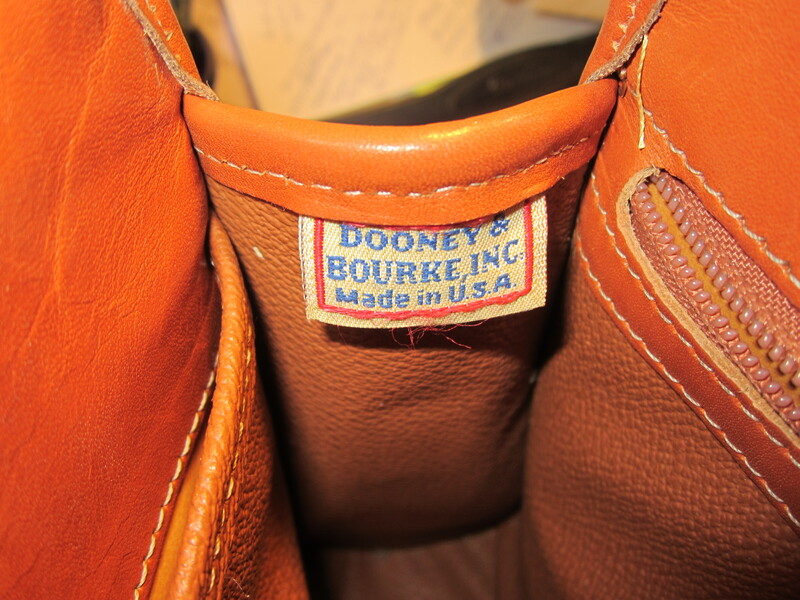 Label – the label says “Dooney & Bourke, Inc. Made In U.S.A.” (label itself is white-ish, letters are blue, and they are surrounded by a red border); the back of the label says A1759857. Any info. you can provide would be great and most appreciated! Yes this is an authentic Zipper Clutch R20 and in great shape !